As of July 24th 2018 Twitter now manually approves all developer access request to API Keys. Given the highly political nature of our global society and the high number of spammers working our economy, who can blame them? In a world where bot nets can be created overnight, social media corporations are discovering they have to be more careful in how they allow their platforms to be automated. Manual applications of course slow things down. They also can make or break a person’s ambitions. Students may not be able to begin (or complete) projects on time. SAAS (Software as a service) companies may not be able to move forward with their commercial projects. Individuals might not be able to create their novelty bots. With the judge and jury sitting on the other side, apprehension can set in. For this article we are going to assume you have a great idea for Twitter automation and are just looking for a little bit of help with your proposal. 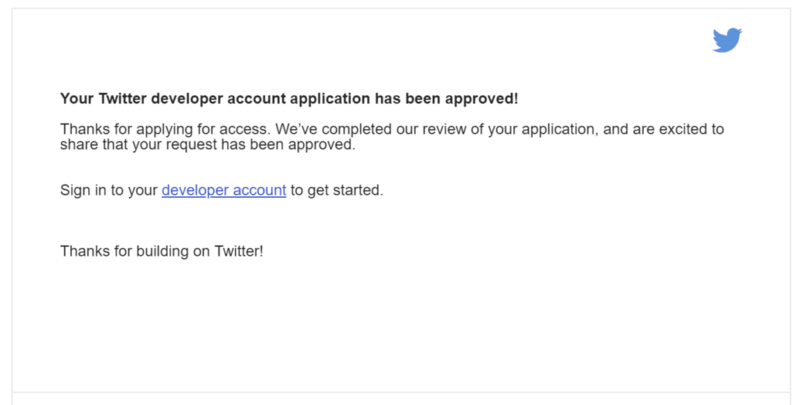 Then we’re going to show you how we applied, and eventually became approved. I would like to hook my Twitter account up to my WordPress site. In this connection I will deliver hand selected photos to our follower list. I would like to use WordPress to manage content creation and content delivery from within WordPress to the Twitter platform. I also would like the option to use Zapier to listen to our blog's RSS Feed. As an opener I thought this was pretty good. It was honest, but not too specific. 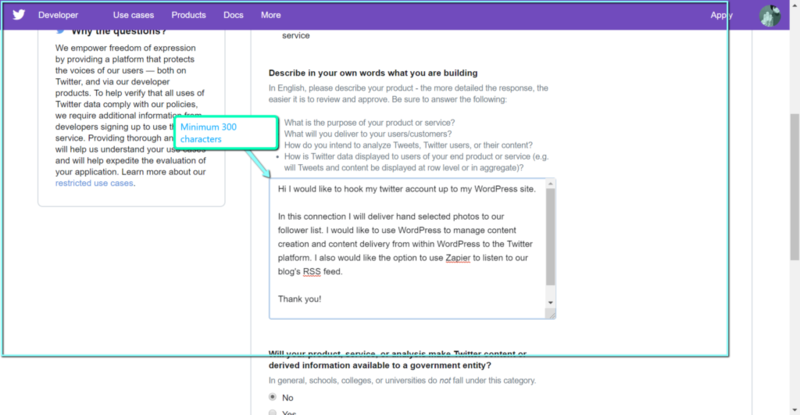 I personally hoped the usecase desire to connect WordPress to Twitter was enough to grant access to a developer account with no greater detail needed. I applied on August 22, 2018. Thanks for applying for access! To provide this information to Twitter, reply to this email. I had to admit, I was a little disappointed I was going to have to reveal more of my hand, but also very happy I wasn’t rejected for an obscure/unknown reason. I was proud of my idea. So told them exactly how I planned to use my developer credentials and let the reviewer know that I was aware of Twitter’s Automation TOS. I assured them we would follow the rules as well. For this account I plan to build and collect inspirational memes related to the anime character Rock Lee from the TV series Naruto. 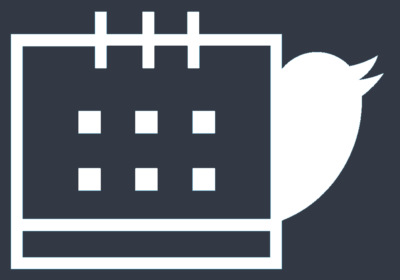 We'll be using a scheduling tool we built as a WordPress plugin to manage our content creation. This project will also serve as a case study for other clients wanting to use our scheduling tool. We have no intention of using the API for likes, or direct messaging, nor does our scheduling tool provide for it. We do not plan to poll for deep tweet or user insights, but we hope to implement insights in the future. We don't intend to use the API to display twitter tweets inside our WordPress Dashboard, but we will embed tweets that our scheduler was used to publish.This way users can visualize their tweet. The approval took a modest 19 days, which isn’t too bad considering Twitter’s moderation program is young and the spammers and social engineers are still out there in full testing this new gated system. I’ve several takeaways from our story, but the most important takeways are to be honest with your application and clarify your understanding of Twitter’s automation rules and then should be on your way to approval. I hope this story helps others ease their nerves and craft approval winning applications. If you would like to see how we used our developer access please head over to our other article: How to build a Simple Twitter Bot using WordPress & TweetBoostPro. I just wanted to come back and say I just moved through another application process for @wptweetboost and was approved in less than 3 days.